Granite Countertop Thickness: 1cm, 2cm or 3cm? 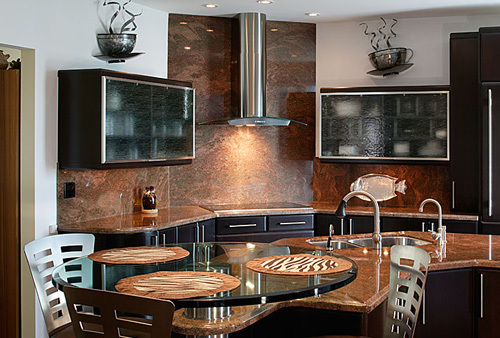 For many years, 2cm Granite and quartz was the “go to” thickness for counter tops. Many times, especially in kitchens, the edge is laminated to a 4cm edge. This size edge is perfect for framed cabinets since that thickness edge can cover the gap between the top of the cabinet and the cabinet door. Even as cabinets became frameless, 4cm edging is still popular. But what about people on the cutting edge? What thickness of counter tops are they interested in? For the last few years, thick counter tops with 6cm – 20cm mitred edges was popular. On islands, the thick edge and material would also go down the side of the cabinets to the floor to create a thick side panel. This gave the counter top a thick and substantial look. This is still very popular in North America. In Europe the emerging trend is to go with super skinny counter tops – 1 cm thickness material. This look is sleek and modern. It goes along with the whole integrated kitchen/home idea that is so popular right now. Appliances are built to be hidden from plain view or its appearance as muted as possible. Likewise, counter tops are becoming more subtle in terms of material thickness. Latitude currently has various 1CM Silestone and Caesarstone materials in stock and acrylics such as Corian and Staron come in 1CM only (traditionally, Corian and Staron edges are built up to that thicker looking edge). It is a new look that is making its way into modern designs. I love the clean look of the thin counter top, but whether or not I would decide to go with that or another look would depend on the overall look of the house. The styles in the home would have to work together. Thinner counter tops would look better in smaller kitchens to make the space seem bigger and as you can tell from the picture above, will look good in a larger space as well. Thick, 4cm – 6cm” counter tops may make a small kitchen feel more closed in.